What better way to overcome obstacles (aka CANDY!) by making a workout out of it. 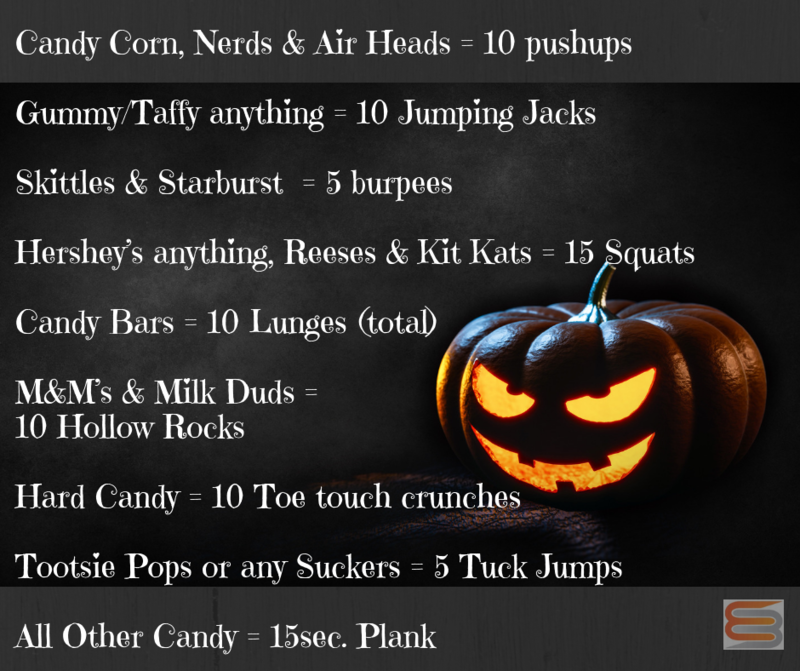 Take out all your kid’s candy and enjoy this at-home workout!! Separate them out into the above groups and count out your total reps for the workout. (If you have 5 candy bars, 5 x 10 lunges = 50 lunges total). Have the kids join you, take a pic and tag Edge Body on FB! Hope you and your fam had a wonderful Halloween!! One of the MAJOR obstacles to improved fitness, weight loss and reaching our health goals in general, is being forced to miss the gym! Maybe it’s kid’s activities, maybe you slept in and maybe it’s a work trip or vacation planned that is keeping you out of class. and so on… Your run distance you select remains the same and each round lunges decrease by 10 and burpees decrease by 5. So last round is 10 lunges total and 5 burpees. **No where to run? Swap out other cardio moves!! It’s that time of year!! Seems like everyone is heading to a beach vacation or a vacation in general. This is a great workout that can challenge you, even if you don’t have a gym where you’re at. Go through this 1x as quickly as you can moving in good form, or perform as a 30 min AMRAP for an added challenge. Swap out rowing, biking or a quick walk if you are in need of a running modification. Watch the above video for full workout explanation and exercise demo. Have fun!!! It happens. You miss a class, or a workout. But sometimes things come up and we find ourselves out of the gym for a couple days etc. This is a great at-home workout to throw in if you know you can’t make the gym for a couple days. This one will hit a little of everything. Watch the quick video above for full workout and exercise descriptions and demonstrations!! !